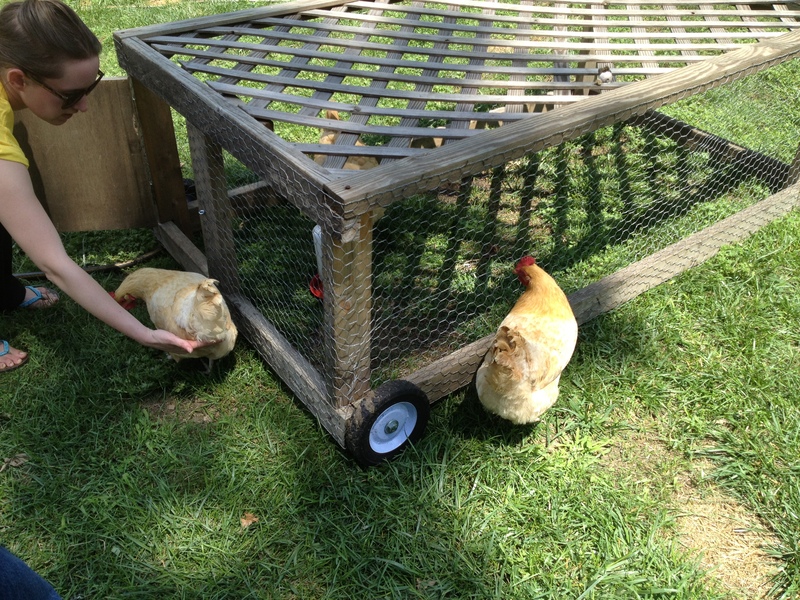 Laura directs her hens into a tractor, a mobile pen. Until a couple weeks ago, when Matt and I visited a friend with a farm in Belleville. Erik Wordhouse was kind enough to show me around his 20-acre farm, which includes a dairy cow, pigs, ducks, quail, turkey and chickens. Yes chickens. Somehow seeing someone I knew building a homestead made me realize I could achieve my mini farm, as well. So I went home and Googled “Fernale chickens” again. I was pleased to discover that last year the ordinance had been changed, and now it is much easier to obtain a permit to raise hens. I couldn’t contain my excitement. I finally confided my dream in Matt. And he surprised me by saying he thought it was a cool idea. In my research, I found the Ferndale Chickens website, run by Laura Mikulski. She is the woman who challenged the old chicken ordinance and became the first person in Ferndale to obtain a permit for backyard hens. Hen house: Laura said she found the three nesting boxes at IKEA (!!!). Sweet. Today Matt and I visited Laura’s yard, and met her three hens. She was kind enough to show off the coop, explain how she built it and tell us what she would do differently if she had another chance. We learned about how to keep water from freezing in the winter, the kind of floor cover that works well in a coop and saw the hens take a dust bath. We plucked tart cherries from a tree and giggled as the hens scrambled for a treat. We also asked tons of questions, and took a gazillion photos. In the end, our visit cemented in us that we could do this. 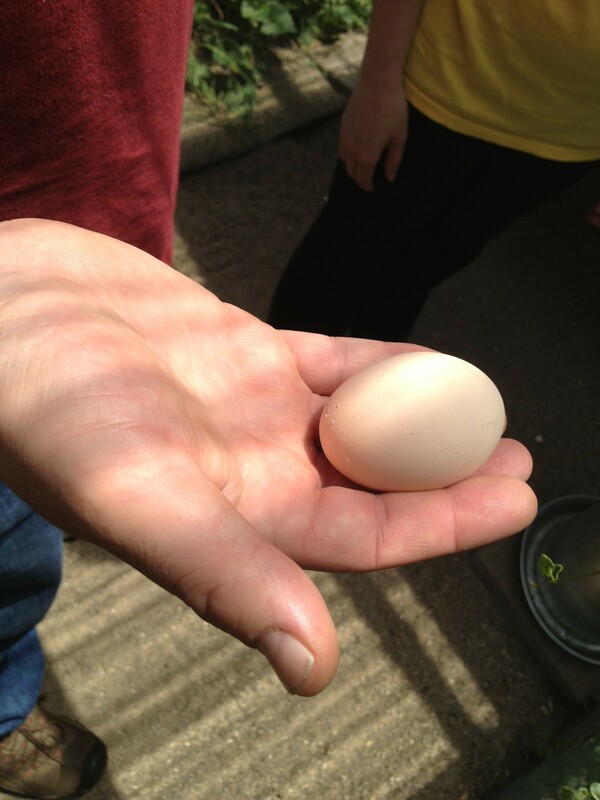 We could raise chickens in our backyard. Laura smiled then quickly disappeared in her house. She returned with a bag of tart cherries. This was definitely the start of something great. Now that Matt and I have officially decided to get chickens, a lot of work waits before us. We need to investigate the permitting process, decide what kind of coop to build, the breed of chicken we want. Needless to say, the work has just begun. Join us as we walk this new road. We plan to share our victories, defeats and discoveries along the way. 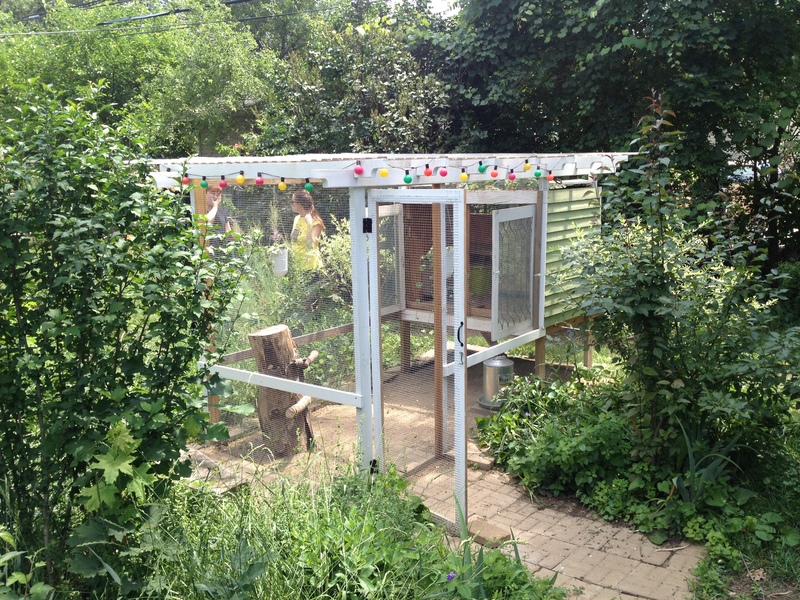 Laura’s coop sits near the back of her yard, surrounded by native plants and trees. Good luck! I’m raising my first little flock and loving everything about it. I think so, too! Yipee!!! Thank you again for stopping by! So excited to have another chickeneer in town, and I really think you’ll enjoy having hens in your yard. Just starting to read your blog – our virgin urban farm will be kicking off in the spring of 2014. We decided months ago to go with the Wichita Cabin Coop design too. We have few variations in plan but for the most part it will be recognizable as a WCC knock off. 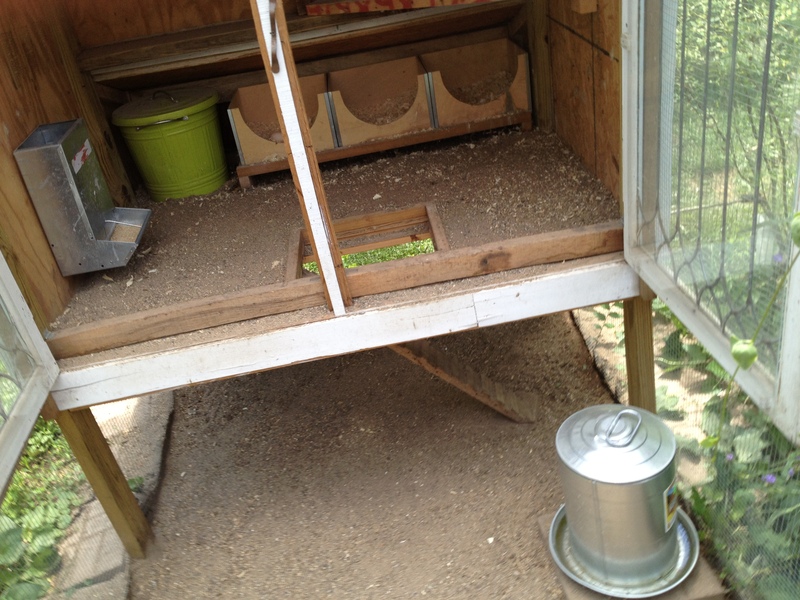 We have also recently cemented this act of transformation for our backyard into an urban farm by placing our chick order with My Pet Chicken for our 7 chicks. I will be catching up on reading your blog and offer my comments and questions as they may arise. If you’re interested, our Facebook page is “7 Heavenly Hens Garden”. Congratulations on your progress to date – looking great !